This cartoon published in the September issue of Budget of Fun reminded voters of the difficult task President Abraham Lincoln had in securing the Union. He is depicted as acrobat Charles Blondin, who was famous for his daring tightrope-walks across Niagara Falls. Here, the commander-in-chief combines two of Blondin’s feats: pushing a wheelbarrow and carrying another man on his back. 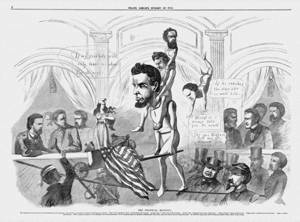 In this case, it is two men: Navy Secretary Gideon Welles on Lincoln’s shoulders and War Secretary Edwin Stanton on Welles’s shoulders. Salmon Chase, who resigned as treasury secretary in June, tumbles off the back of Stanton.